Along with M.F.K. Fisher and Julia Child, Elizabeth David changed the way we think about and prepare food. Her nine books, written with impeccable wit and considerable brilliance, helped educate the taste (and taste buds) of the postwar generation. Insisting on authentic recipes and fresh ingredients, she taught that food need not be complicated to be delicious. Elizabeth David, who died in 1992, was a very private person who seldom gave interviews. 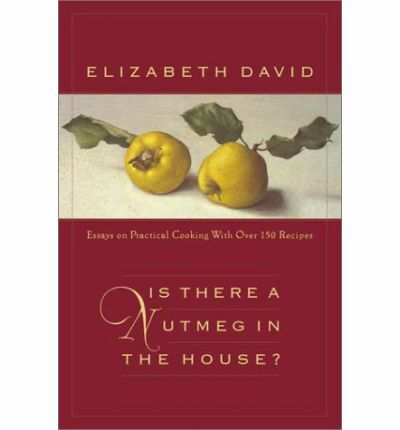 However, a 1984 collection of her journalism entitled An Omelet and a Glass of Wine greatly revealed David to her readers and is now considered the best food book written in the 20th century. Now, nearly twenty years later, Viking will publish the sequel to that landmark book. Is There a Nutmeg in the House contains material that has never appeared in previous collections. The emphasis throughout is on the practical aspects of cooking and eating and the book includes 150 recipes from around the world. Delightful essays on her various likes and dislikes - from the wonders of nutmeg to the utterly useless garlic press - complete a unique picture of what for so long made David the most influential writer on food in the English language.